A Poem A Day – Do We Need Something? Three chapters revised. Twenty-nine to go. Though at this juncture, there are two chapters that I think will be entirely cut as they really do not contribute to this story. The thing that I’m loving about this process is the time that has passed since I wrote the early draft. I’m far enough removed from the material to truly rewrite and revise. For other writers reading this blog, feel free to offer your input. The one aspect that I’m most struggling is the POV. I’ve gone back and forth between first and third person (limited). It is nonfiction, and I know that traditionally, nonfiction work is in first person. But I like the feel of the “hero” being un-named and in third person for numerous reasons and creative ideas. I’m counting anything fluid that I consume as “water” from here on out. I’ve done either core strength, stretching or meditation daily. My weekly family excursion was to Hagerman. This was extremely exciting for my youngest son who wants to be a Paleontologist. He loved the fossils, the teeth of ancient beasts and their eating habits. We ate at the Snake River Cafe and had a picnic along the river on our return home. The backyard “oasis” is complete! Writing and creative space near a few chimneys and firepits along with my garden and flowers. The chickens are happy. The pugs are happy. The Chiweenie and Bearded Dragon seem to be living a life of bliss. I need to carve four hours a day to writing. This is my goal. I know, realistically, I cannot write four hours in a row…but the sprinkle of time throughout my day is what I know I need to get the job done. Wish me luck. Offer help. Keep on writing. Twenty-eight pages. That is a good day of revision. One of my goals with this long narrative is that each chapter can be published as a stand-alone. Today, I feel that this chapter is complete and could carry the weight of story all on its own. I know every writer has their own system, their method to “warm up” to write. I have a beautiful fountain pen with deep purple ink and I love both the sound of it scratching on paper and the way it feels as I write in my journals. It isn’t writing in a creative manner, I’m actually copying poems from my past journals into one place. This process connects my mind to my heart, my heart to my hand, my hand to pen and finally, pen to page. It is a quiet process. And slow. I have a permanent purple ink stain on my finger where the pen rests that looks like a deep bruise. This is one of those warm ups into writing. Family Adventure = Bowling at Big Al’s. My gutter ball was so slow that it stalled in the gutter and I had to flag down a staff member to walk onto the lane and retrieve it for me. My youngest son beat us all in the first game. My disabled son won the second. I lost every time. I consider myself the entertainment factor for bowling as I roll it down the lane carefully so I don’t hurt my neck. Core Strength = I held in my stomach most of today. Guitar = it hurts to play. I can strum, but not pick and am only decent at three cords to date. New Dish = Chicken Tortellini – Kosher, of course. Coated in salt, cracked pepper, olive oil, rosemary and a titch of lemon juice. New Discovery = I enjoy my mid-life hot flashes. My feet are always cold and having this new internal heating pad doesn’t seem such a bad deal. At least for me. Writers absorb the world in more detail than the average bear. We feel things more intensely and notice what is less obvious to the naked eye. Today was a day to take in the world. My sons and I prepared 50 peanut butter and jelly sandwiches and packed lunches for those less fortunate, those without homes. Since many Veterans suffer from homelessness, this was our way of giving back to those who were willing to risk the most ultimate sacrifice for our many conveniences. My youngest needed music while “working” and so we listened to the “Purple People Eater” almost 8000 times. I had over-purchased jars of peanut butter and jelly, so on our way to deliver pre-packed lunches, which included fresh fruit and bottled water, we paused at the local food-bank and donated our excess product. We took to the streets armed with the hope of giving. Initially, we couldn’t find anyone in need. We went to the normal corners where we notice those with a sign, “anything will help” or “family of four in need”. It took us over three hours to hand out 50 lunches, but we found them, people in need tucked away in the crannies of our city. They were lying near storefronts and in parks. One man paused, shook my hand and then saluted me, saying “G-d bless you and your family.” Another just kept saying thank you over and over. What stood out the most were three people, separate from one another. They each were clearly hungry, yet they declined our offer for a free meal. It was heartbreaking. I knew that they didn’t trust us. Someone, somewhere had violated that trust. Someone, somewhere had pretended to offer them something good and somehow took terrible advantage of them or someone they knew. They had been hurt or deceived or worse. I didn’t want to think about it. Great storytelling involves scene, capturing the concrete details and creating a world that the reader can enter, like a dream. But it can also involve, sometimes more than anything, the main character returning to their ordinary world changed. We, as a family, returned home altered, changed. We felt great because we helped someone else in some small capacity. But emotions are complex and we felt awful that we could not do much more and that so many people are hurting. Later, I met with my writing group, my tribe and I thought it funny how most of us sat there with pens that glide and journals small enough to carry everywhere. How alike we are in some connected capacity, yet how different the stories we share with one another in the hope of feedback to help shape us into better writers. It was a good day for writing, one of heartfelt adsorption of the world around me and a connection with like-minded people I respect and admire. It was a good day for living, one of opportunity to instill in my sons the greatness of serving others and appreciating all that you have. 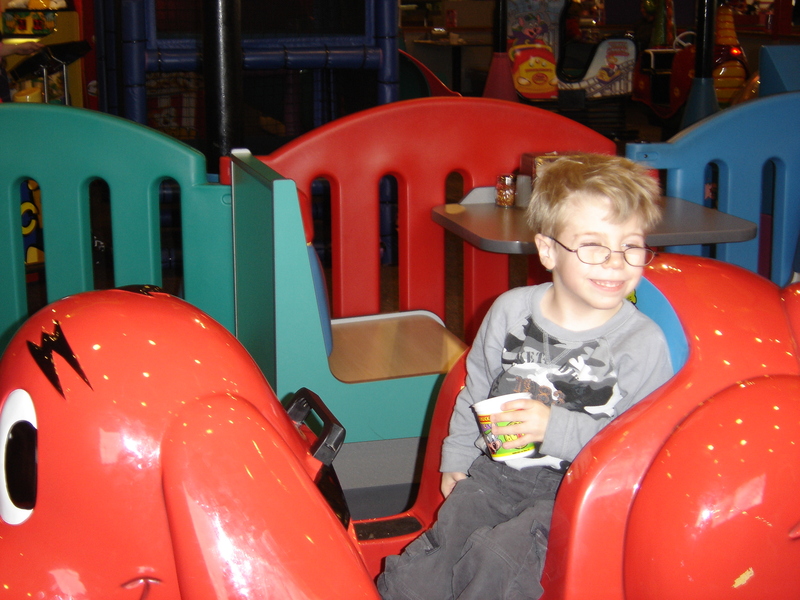 My oldest son was virtually blind his first year. He had bilateral, centralized cataracts in both eyes, so his world was, at best, a gray, hazy landscape of unfamiliar shapes. I walked him through his world with sensory input in mind. We would pause beneath a tree along our path and I would rub his hand against the bark. “Bark,” I would say. “Tree, I mean.” No, no, no. “Rough.” There that was a better description. The same would happen at bath time as I would splay his fingers across a towel. “Soft,” I whispered. He would smile. “Towel,” I spoke. He shook his head. By the time he was 18 months, he had his first of many surgeries on his eyes. This one in particular made an impact. The doctor placed in his eye an innocular lens, a fake camera to the world so his brain could understand these messages I had been trying to offer him. After two weeks with a steel patch, he was able to open the one eye and see color. See me. I always thought he understood my presence. Even without vision. While “blind”, he smiled and wildly waved his hands when I entered a room. I thought he always knew when I was there. More important, I thought he knew when I was not. That first night with his new vision was traumatic. For me and for him. I placed him in his crib at 7 p.m. as usual, after stories and songs and rocking. I turned out his lights and started to exit and he screamed. I patted his back to calm him. He kept screaming. He did not know darkness. He did not know my absence. This was a new journey of security and trust. Six weeks later, his vision was restored in his other eye. It took a year for him to adapt to darkness, to sight, to distance and space. Thirteen years later and I doubt that he has ever adapted to absence from me. OK, that is most likely the ego-need of a mom speaking. The amazing thing that I have found about my son is his intuitive nature. He knows things. I can’t explain it. I think part of this is because he developed his other senses far beyond the scope most of us utilize. He had to do this in an effort to navigate his world. In his limited/disabled youth, he is wise. I always tell people that I am far more disabled than he. I think that vision is a gift. I also think that the lack of it can be a gift as well. As long as we can “see”, whether that is with our ears or our eyes, it matters not. We mostly need to learn to read this world and “see” it with our hearts. This is the journey that I am on, nearing my half century of life. The wobbly first step appears to be the most difficult, but becomes the most exhilarating. Something unknown, yet the toddler fills with life. Her curiosity erases her fear. The awkward first blast from the sprinter’s starting blocks looks embarrassing, but is alive with excitement and anticipation. Blinded with wind in her eyes, yet the young athlete pushes forward, overflowing with determination. She shows no shame. The clumsy first dance on the eve of a social gathering seems humiliating. Experiencing young love, the girl sees only the eyes of her date; the one she hopes will be her first real kiss–the kiss that counts. She is complete in her thoughts and her dreams. She understands no judgment. The unstable brave step out of an abuser’s prison proves a shattering event, but grows into a move based on faith. Horrified that she has found herself in this place, she slowly allows self-forgiveness. She realizes she can move on and heal. She knows no limits. Her garden. This was the place she returned when there were in-between moments that needed to be filled. And the place she grew into a habit, something she could count on. It gave her a sense of letting go and controlling within the same breath. When she left her marriage—suddenly, abruptly, unexpectedly—she took her sons and their medicine and left her life behind. Over a year had passed before she realized she missed mostly her garden. As she brushed ashes off herself, blinking away sweat and fear, she began to rebuild a life, rebuild a home and rebuild a garden. It was only recently that she finally saw the dirt. She dug until it hurt beneath her nails, nearly drawing blood. The earth was hard, clay-like, not a good foundation to nurture anything tender, such as a seedling. Weeds choked out beauty and flowers clumped together as though they had support within a multitude. Tree branches hung low, blocking out the sun and creating a mowing hazard. Areas in the lawn were barren, cracked wide as though the bowels of the earth yearned for something from above. The square foam would protect her knees from the hard ground. She tossed it down, knelt and began. Her hair drawn away from her face with a scarf made her look older than her youthful mid-forties. She smoothed back the wet strands stuck to her forehead, smearing dirt on her skin. Dig the hole. Fill with water. Gentle settle in the roots. Add some food. Add fresh soil. Begin again. One plant at a time, she built out of nothing. Early next spring, when it came time to till, she would fill the plot with water and encourage her children to take mud baths before the homemade compost was added. She promised this more to herself than her children. For now, she had already mixed the compost and began mixing it into the soil, breaking clumps of root into sand and setting rocks gently into an empty terra-cotta pot. The belly of the earth was white ashes and she had to dig through this and replace the cinder with rich, black dirt. Somewhere inside she knew that gardening was more about growing good soil than bearing fruit. This was true of her life as well. Weeks passed before she could finally run her hand over top the lavender, sprinkling the scent into the air. The cracks in her hands now stung, deep and dark from dryness. She took the soft earth into her hands and rubbed, polishing away dead cells. Then she pinched Rosemary, Sweet Basil and Lemon Thyme off the plants and rubbed the herbs into her palms, creating a mulch balm of her own. The leaves on the pumpkin plant resembled elephant ears and they divided her perennials from her vegetables. Only one pumpkin sprouted to life this time. After another year, the garden would almost maintain itself, growing into something more than she imagined at the start. It would have its own life and plants would regrow on their own terms, in their own way. The start of weeds and tiny grass blades poked along the edge and beckoned her attention. Each morning before her children woke, she sat with coffee and tended her garden. This morning was no different. A small basket at her feet filled with onions, garlic, tomatoes, cucumbers and radishes. She only took from the herbs as needed for cooking, but usually brought a pinch of Stevia inside for her afternoon tea. She squeezed her eyes and tasted the saltiness of her tears, unaware that she was crying. Her skin stretched tight from a sun burn, her scalp was tender to the morning rays. She heard her youngest wake, felt a foreign smile touch her lips and walked towards her home, towards her life. The following is inspired from a writing exercise from a David Whyte workshop. My Writing Muse, Ron in Indiana, added a twist to the exercise with the ending to the prompt. Enjoy. It doesn’t matter what others think because they do not hold the desires of my heart in their minds. They only hold their old blueprints, judgments, opinions and value systems. It doesn’t matter what others think because their ideas are based solely on their exposure. They have not endured my journey through my eyes, so they cannot truly understand the place I am emerging from. It doesn’t matter what others think because they can only respond to life out of their own history, from their limited experiences. Though compassionate, not one of us can truly step into anothers’ footprint. It doesn’t matter what others think because I must hold true to what I believe first. If I operate out of the need to please others or avoid conflict, I will lose sight of my path and surely let go of my purpose. It doesn’t matter what others thhink because man’s thoughts are often not in alignment with God’s thoughts. We are frail humans, broken, undiscerning and off course. I must keep my focus on doing that which honors God. I must call into my movie only the situations and people who guide and help me do this. Yet, in a sense, how others think can matter, but how they behave when they walk along side you matters even more.